Cheryl Cole caused yet more controversy on the X Factor results show yesterday, after refusing to vote and send one of her contestants home. For the first time ever, two of Mrs C’s acts – Katie Waissel and Treyc Cohen came bottom of the table, along with Tesco worker Mary Byrne, but after Mary was saved, the pair were forced to sing for survival against each other. Unsurprisingly, Wagner sailed through to the next round. Troubled singer Katie chose aptly name hit Please Don’t Give Up On Me for her dramatic final performance – which ended with her sobbing on the floor – while Treyc held it together for her rendition of Toni Braxton’s Unbreak My Heart. It was thought Cheryl would choose one of her acts to leave the show, but the star threw a spanner in the works – and angered many fans – by refusing to send home either. 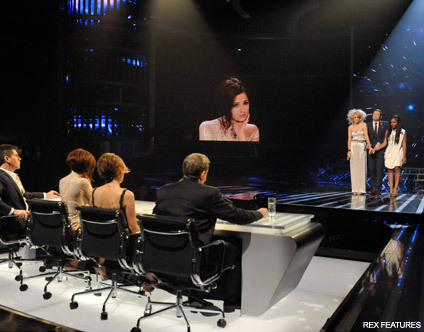 In the end it was left to Louis to give the casting vote, and after much deliberation he kept controversial Katie in the competition, adding that despite her shaky performance, she was more interesting to watch on TV. Despite being axed, it seems Treyc doesn’t hold any grudges, and revealed she understands why Cheryl didn’t vote. ‘If I was in her position I don’t think I would have voted either, it wouldn’t have been fair to the other act,’ she told Daybreak this morning. ‘I felt like a princess on Saturday night, I loved the song and thought I did a good job… I am planning on staying in London and working on my singing career,’ she said. We want YOUR thoughts on yesterday’s eviction? Are you glad the judges saved Katie Waissel? Or should Treyc have stayed? Let us know in the box below.